In contrast to the unusually early spike of flu activity we saw this October, Google Flu Trends is currently showing a low level of activity in the United States. Since the strain of influenza that is active (H1N1) is novel, no one knows exactly what will happen next. However, the CDC is warning that one possibility is a second spike of flu activity, which is what occured in 1957 when another novel strain of influenza spread in the United States. We've been chatting with public health officials about new ways we can help people understand the spread of flu during this unusual time and today we're excited to bring city level flu estimates to 121 cities in the United States. By tracking the popularity of certain Google search queries, we're able to estimate the level of flu in near real-time. 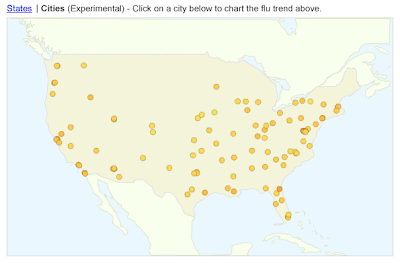 Google Flu Trends is updated daily and may provide early detection of flu activity, since traditional flu surveillance systems often take days or weeks to collect and release data. These city level estimates are "experimental," meaning they haven't been validated against official data. However, the estimates are made in a similar manner to our U.S. national estimates, which have been validated. Check out our YouTube video for a quick introduction to this system. We're pleased to be announcing this addition to Google Flu Trends during National Influenza Vaccination Week. If you're looking for a flu vaccine location near you, please visit the flu shot finder.